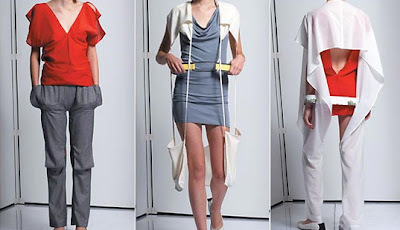 Lika Volkova and Alessandro DeVito, New York based fashion designers give the mere definition to fashion forward. Their brand SANS, is an eco-friendly fashion line which aims to minimize waste at its best without any compromise on pushing forth their stylistic design. Although they do not consider themselves eco-friendly but rather waste friendly. 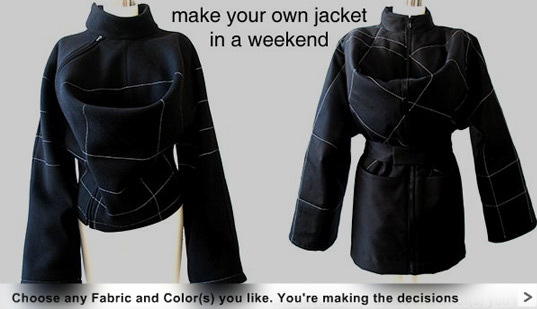 The idea behind the business model is, "If you like it, you can make it," (something like a DIY for Fashionistas). It is a literal translation of supply and demand; and in turn, such a practice eliminates allocations and shipments, as well as housing garments, which ultimately excludes the likelihood of the unwanted remains of unsellable quantities. It is quite an impressive venture. Now it's simply the public's turn to respond to a smart solution in answering the emergence of global problem. Below are just some examples of SANS thought-provoking designs. Baggu, is yet another smart design--employing a simple solution in eliminating waste. It's shaped like a T-shirt, and can be folded up into a wallet size. Emily Sugihara shows us her idea of function and beauty designed for addressing our day to day needs. Wait did she just pull out a Nabaztag out of her baggu? This summer the Burnham Plan Centennial in Chicago will be immensely fortunate to unveil the designs of Zaha Hadid's and Ben van Berkel's collaboration in designing two eco-pavilions, both embodying an eco-friendly solutions while demonstrating awe-inspiring architecture. Hadid's structure will be erected by using stretched fabric over an aluminum frame. Just as Hadid's Chanel Pavilion traveled globally to transport the exhibition to each city, the same concept will be applied for this pavilion. The idea is not to use sustainable materials necessarily, but to create an edifice that can be recycled and showcased through out multiple locations. Below is a video of Zaha Hadid on her design philosophy.